In the unlikely event that we do not deliver the number of visitors promised within 60 days, we will provide a refund of your entire purchase price. In cases where refunds are claimed, we reserve the right to further investigate and approve or decline your request in the event that we would be able to prove in a court of law that we have satisfied the terms of our service. In the event that the Client's site becomes unavailable for any reason ("server is down or unavailable, timed out, or shows to be active but with internal server errors, 404 errors and other types of common or uncommon errors associated with the internet and its underlying infrastructure"), the Client will not hold WebTrafficMarket.com or its Partner Sites responsible for these errors. 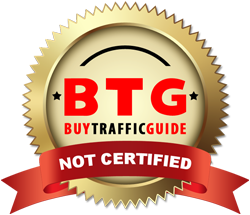 All/Any traffic delivered to the Client's site during this down time will not be credited or refunded. We employ a tracking system via a 3rd party server to track your ad campaign. Each campaign is given a unique campaign ID which is used to track visitors to your site at any given time.